The Toyota Camry is a very popular sedan in a lot of global markets. The vehicle is known for its bullet-proof reliability, space and comfort. In a lot of countries, the car is used as a taxi and cabbies swear by the vehicle. However, Toyota just couldn’t hit the right chord with buyers in this segment in India. The previous generation Camry sold in few numbers to private customers compared to the Skoda Superb while largely hotels bought the car. The seventh generation Camry came to our country in 2012 and it didn’t sell in big numbers in India thanks to the fact that it was expensive and came with a short equipment list. Toyota has now launched the 2015 Camry and it comes across as a hugely improved car over the pre-facelift model. Quest: It is only in India that such vehicles like the Camry are called premium vehicles. In other markets like the USA, UAE, etc. the Camry is a basic sedan that is owned by many. In the UAE, the Camry is one of the most popular taxis and rightly so. Toyota cars boast of unbeatable reliability and they can outlast the owner if driven and maintained well. The chassis of the new Camry (codename XV50) is pretty much the same as the earlier one (XV40) — they share the same wheelbase and have similar overall length. There’s nothing spectacular about the greasy bits either — it’s a transverse-engined, front-wheel-drive platform that uses independent suspension all around. The radical changes on this car are on the surface. With a complete revamp of the sheet metal, the new Camry looks like a Lexus and this works in its favour. The swept-back headlamps and the large chrome grille are the highlights of the nose and there’s more than a hint of sportiness in the protruding chin and fog lamps, which sit well inside the front bumper. You could argue that the nose is quite generic, but it does look quite attractive in the flesh. The defining feature of this Camry though is the roofline. It swoops less than the old Camry’s and you can imagine the headroom this shape liberates on the inside. The rear of the Camry is dominated by those huge tail-lamps and that thick slab of chrome that Indians seem to love. It’s an uncontroversial shape and Toyota hasn’t taken any risks. Despite its size, the Camry’s wheelbase isn’t as big as you would expect. However, this isn’t as big an issue as it sounds — the Camry’s interiors are really well packaged. ;Thanks to its larger body – it was 35 mm longer, 10 mm wider, and 70 mm taller than the old model – the cabin was roomier. Front and rear headroom were increased over the outgoing car, and rear seat legroom grew by a massive 98mm.The seats were comfortable and quite supportive, and passengers sat relatively upright, which yielded good all-around vision and made it easier to get in and out. Functional best described the Camry’s cabin; the controls were easy to operate, although the handbrake lever on the left side of the centre console was awkward.Along with the roomier cabin the boot was also generous, it was 10 per cent larger than the old model, and the split fold rear seat made it even more capacious.All but the Altise had cupholders in the front and rear. The all-new Camry features new petrol powertrains, including a 2.5-litre 4-cylinder mill and a 3.5-litre V6, both of which, come paired with a new 8-speed automatic gearbox. The 2.5-litre engine is also available with the next-generation Toyota Hybrid System, which features a CVT. In the case of the hybrid, the battery pack has been moved from the trunk to under the rear seat, again, to ensure a low centre of gravity. The Toyota Camry is comfortable. In fact it is as comfortable as the likes of a Jaguar XJ that we drove last week, which is quite impressive considering it costs about three times less. We particularly love how the Camry is also extremely well damped and showcases really high levels of build quality which in turn reduces fatigue. The Camry might be large in terms of its overall size but in fact it is quite easy to drive due to the fact that it is easy to look out of and park. We also like how comfortable the Camry feels in the back seat as the well damped suspension works overtime to make sure the occupants remain as comfortable as possible. The Toyota Camry is one of those cars that hates to be driven fast or handled by the scruff of its neck. In fact, asking it to handle and corner like a BMW 3 Series or even an Audi A3 is like asking a Chess grandmaster to get into a wrestling ring. That said, the Camry isn’t as soft as a biscuit dropped in a glass of hot tea. It does feel quite composed for most part and only feels uncomfortable if you really push it beyond legally allowed speeds. The steering too, like most Toyotas is really light at city speeds but does weigh up as you get faster. That said, it is nowhere as responsive or precise as other cars that are priced similarly. The brakes though are quite responsive and do offer an adequate amount of bite both at city and highway speeds. Various safety features are integrated in this stylish sedan for utmost safety of passengers. To simplify the parking, the vehicle has clearance and back sonar with illustration display. It has an advanced engine immobilizer along with security alarm system, which gives prevention from unauthorized entry into vehicle. Additionally, SRS airbags are fitted for the safety of driver and co-passenger. It also has speed limiter, anti-pinch windows, ISOFIX child seats mounting points, speed sensing automatic door lock and impact sensing fuel cut-off. 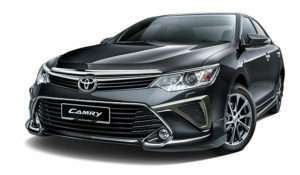 The Camry had a lot going for it once Toyota began CKD operation of the hybrid version. It is good looking, eco-friendly and as we have seen in the review, extremely comfortable to sit in the back and be driven around. The external changes and increased feature list add quite a bit of value to the car making it an even more mouth-watering proposition. One of the things that should help the Camry Hybrid sell is the fact that its buyers are now offered a significant discount under the FAME initiative (Faster Adoption and Manufacturing of Hybrid and Electric vehicles) which the Centre introduced in the 2015 budget.